the University of Texas at Austin, the University of Illinois at Urbana-Champaign, and the University of Michigan. BYU is the only top-ranked institution that doesn’t offer a PhD program. In an additional PAR poll, BYU accounting programs received the second-most first-place votes from professors who didn’t rank their own programs No. 1indicating the respect BYU has earned among the nation’s top professors. “Receiving this recognition is a validation of the quality of our students, faculty, and curriculum, all of which have helped build our fine tradition,” says Kevin Stocks , director of the School of Accountancy. “It opens tremendous opportunities as our graduates prepare to enter the workplace.” BYU CIBER Hosts High School Business Language Competition Students from Utah high schools tested their language and business skills in the third-annual High School Language Competition, hosted by the Whitmore Global Management Center/BYU CIBER and co-sponsored by Nutraceutical Corporation and the Center for the Study of Europe at BYU. “Our goal is to help students interested in foreign language discover that there are other ways to use the language—not just as a tourist but also in a career setting,” says Cynthia Halliday , event organizer and managing director of the Whitmore Global Management Center/BYU CIBER. Each participating school formed a team with the challenge to develop a business plan and presentation focused on marketing a Nutraceutical Corporation product to Utah’s Hispanic community. The teams were composed of three students each, which included heritage and nonheritage Spanish speakers. The competitors spent many hours after school working on the details of their platforms and refining their language skills. After viewing the Spanish-only presentations, the executives from Nutraceutical Corporation awarded Skyline High School first place. Timpview High School and Orem High School came in second and third, respectively. High School Language Competition first-place team members from Skyline High School. 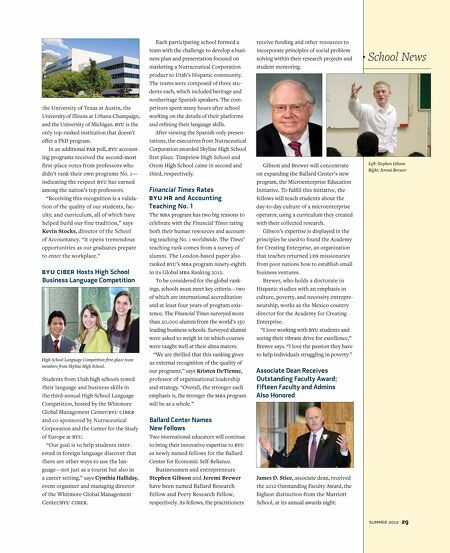 Financial Times Rates BYU HR and Accounting Teaching No. 1 The MBA program has two big reasons to celebrate with the Financial Times rating both their human resources and accounting teaching No. 1 worldwide. The Times’ teaching rank comes from a survey of alumni. 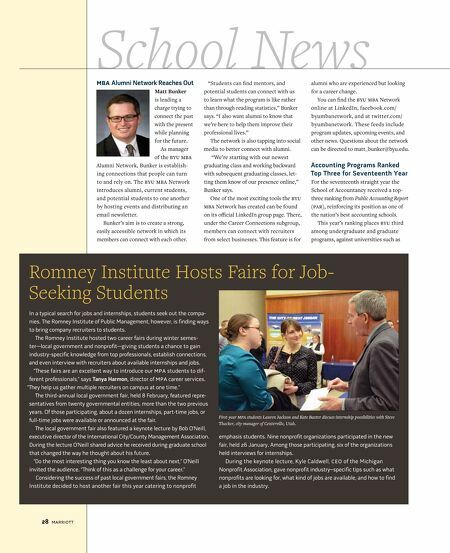 The London-based paper also ranked BYU’s MBA program ninety-eighth in its Global MBA Ranking 2012. To be considered for the global rankings, schools must meet key criteria—two of which are international accreditation and at least four years of program existence. The Financial Times surveyed more than 20,000 alumni from the world’s 150 leading business schools. Surveyed alumni were asked to weigh in on which courses were taught well at their alma maters. “We are thrilled that this ranking gives us external recognition of the quality of our programs,” says Kristen DeTienne , professor of organizational leadership and strategy. “Overall, the stronger each emphasis is, the stronger the MBA program will be as a whole.” Ballard Center Names New Fellows Two international educators will continue to bring their innovative expertise to BYU as newly named fellows for the Ballard Center for Economic Self-Reliance. Businessmen and entrepreneurs Stephen Gibson and Jeremi Brewer have been named Ballard Research Fellow and Peery Research Fellow, respectively. As fellows, the practitioners receive funding and other resources to incorporate principles of social problem solving within their research projects and student mentoring. Gibson and Brewer will concentrate on expanding the Ballard Center’s new program, the Microenterprise Education Initiative. To fulfill this initiative, the fellows will teach students about the day-to-day culture of a microenterprise operator, using a curriculum they created with their collected research. Gibson’s expertise is displayed in the principles he used to found the Academy for Creating Enterprise, an organization that teaches returned LDS missionaries from poor nations how to establish small business ventures. Brewer, who holds a doctorate in Hispanic studies with an emphasis in culture, poverty, and necessity entrepreneurship, works as the Mexico country director for the Academy for Creating Enterprise. “I love working with BYU students and seeing their vibrant drive for excellence,” Brewer says. “I love the passion they have to help individuals struggling in poverty.” Left: Stephen Gibson; Right: Jeremi Brewer Associate Dean Receives Outstanding Faculty Award; Fifteen Faculty and Admins Also Honored James D. Stice , associate dean, received the 2012 Outstanding Faculty Award, the highest distinction from the Marriott School, at its annual awards night.